MILFORD, Indiana, USA - Chore-Time has announced the release of its LIBERTY® Feeder for poults and for turkey hens up to 12 weeks of age. Chore-Time's LIBERTY® Feeder features a green feed cone with an incorporated Bird Positioning Ring to encourage birds to eat from the pans perimeter. Perimeter eating helps maintain feed quality and eliminates the need to rake crusty feed out of poult feeders. Because seeing moving feed helps attract poults, when the LIBERTY® Feeders feed cone is raised to flood the pan, its unique shape makes it easy for the poults to see the flowing feed. There are no windows to restrict the feed flow which results in greater feed visibility while still permitting feed to be heaped high for young birds. Chore-Times LIBERTY® Feeder includes the ability to provide ALL-OUT Feed Flooding whether the feeder is on the floor or in the air. The LIBERTY® Feeders feed cone can be manually locked into the full flood position, or growers can use winching for a variable flood level as birds grow. Using a winch mounted at the center of the feeder line, the feed level can be adjusted simultaneously in all feeders at once up to 100 feet (30.5 m) in each direction from the winch. The LIBERTY® Feeder features design characteristics for bird comfort including a patented scalloped grill/pan edge that fits the rounded shape of the birds and an open grill structure with just four spokes to make it easy for birds of all sizes to eat. The feeder also includes openings in the top of the grill to deliver light and air to birds while they eat. The Feeders rounded pan bottom shape moves the feed out to the pans perimeter for easier bird access for eating. Chore-Times LIBERTY® Feeder is designed to save feed. A feed-retaining lip is formed where the feeders grill meets the pan. 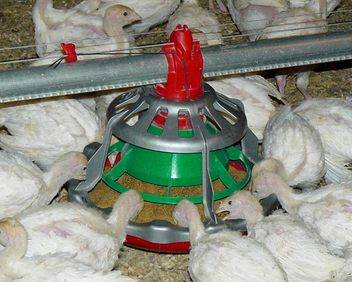 The feeders Bird Positioning Ring and incorporated fins serve as an anti-rake device when lowered into the feed. Made of non-corroding, all-plastic parts, the feeder features six feed level settings from 0.375 inches (9.5 mm) to 1.5 inches (38 mm) to control the amount of feed dispensed when the feed cone is in the lowered position. The LIBERTY® Feeders hinge locks hold the pan in place during cleaning. Feeders can also be rotated upside down on the feed line to empty out feed between flocks. 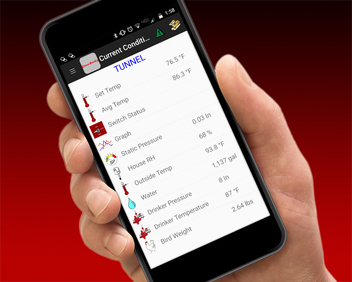 Mechanical and electronic control pans are available in both intermediate- and end-control models. The LIBERTY® Turkey Feeder is part of Chore-Time's complete line of integrated products for turkey production including feeders, drinkers, feed conveying, feed storage, ventilation, heating, cooling and controls.